Azam Gill has been involved in full-time ministry in Pakistan since 2002 and is very passionate about the gospel. He is fearless and travels around a lot encouraging, mentoring and training people. He is very involved in church planting. Azam also sees the need to equip people to become self-sustaining educationally and economically. The minority Christian community suffers much discrimination and they have little incentive and resistance left in them. They have little economic capacity or opportunities and Azam wants to see that changed. He and Barbara have therefore set-up a number of sewing centres and literacy classes, training women to sew and ensuring men are able to read (PAK01 and PAK05). 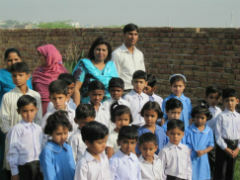 They have also established a school (PAK06) and numerous other local initiatives. BHW has had a relationship with Azam Gill since 2002 after our Field Director met him at an international conference. They corresponded for a number of years and in 2008 BHW funded a pilot sewing programme in Islamabad where 20 women were trained. Early in 2011, as the number of projects Azam was involved in increased, he was struggling to financially provide for his family due to the amount of time he spent overseeing the projects. In an effort to relieve some of the financial pressure he was under BHW therefore commenced providing some personal financial support. 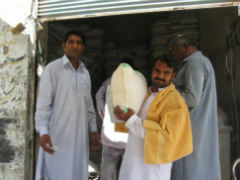 This partnership specifically provides financial support for Azam and his family. We have had a relationship with Azam and Barbara for a number of years now and have been impressed by their commitment to the Good News and their desire to see the lives of those around them improved both spiritually and physically. They have a good reputation and have been involved with ministry for many years. Barbara has a good rapport with the women and there is good acceptance of them in the community. Azam has been in ministry since 2002 and is very passionate about the Good News. He is married to Barbara and they have three children. Their names are Azar (boy), Izia (boy), and Eliza. Azam gave his life to the Lord in 1987 and in 1991 joined Bible School in Pakistan. After that and before marriage he studied theology in the Philippines. The Gill family is well known and has served the community for many years, especially in Rawalpindi and Islamabad. He has a heart for evangelism but understands the need to provide training and education to the poor in his community. He sees his role is to commence a church, hand it over and then move on to another place. He has also travelled to Africa and other places to assist with church planting and evangelism. They both come from Christian backgrounds, Azam from Christian brethren and Barbara from Baptist. They are passionate about seeing communities transformed by the power of the gospel and the presence of local churches. They are very friendly and hospitable and spend much of their lives serving other people. Barbara is a school teacher / administrator by profession and is leading the development of the training and poverty reduction programmes. These include the establishment of a school in the suburb of Wazir in Islamabad. It is a Christian school, but most of the students are Muslim and many are from the Pashtun community, a despised, gypsy-like, ethnic minority group feared by most Pakistanis. She also oversees the operation of the sewing programmes in Rawat township and the adult literacy class there. She is full of fun and loves to cook and entertain guests. Currently Bright Hope World provides US$1,320 annually to financially assist the Gills. It is anticipated that as the school becomes more financially viable it will provide an income for Azam and Barbara and support from BHW will no longer be required.